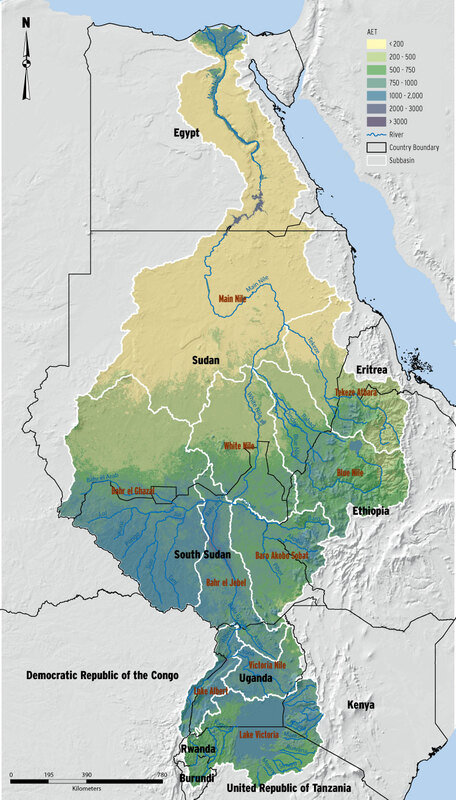 A comparison of the mean monthly actual evapotranspiration for the sub-basins within the Nile basin is presented here together with the precipitation and the potential evapotranspiration. The rainfall seasons can be seen on each of the sub-basin graphs. In some cases, the rainfall is much higher than both the actual and potential evapotranspiration, indicating a surplus apart from the main Nile. The equatorial lakes region shows a bimodal type of rainfall pattern (with peaks in April- May and October-November), and in both wet seasons, the rainfall exceeds the actual evapotranspiration whereas the eastern Nile has a unimodal pattern (with its peak in July-August) in which the rainfall exceeds the actual evapotranspiration during the wet season. The sub-basins with open water bodies, wetlands, and/or irrigation schemes exhibit higher evapotranspiration compared to the rest.